Every week, we round up the best tips that you post in io9's tips forum. This week, we've got a mash-up of Steampunk: the Musical!, toy car explosions, stem cells, Star Wars, fat-battling robots, and much more! If you want to post a tip, just click on the #tips link on our navigation bar, or include the word #tips in any comment, on any post, that you think is a good tip for the people who read and write io9. 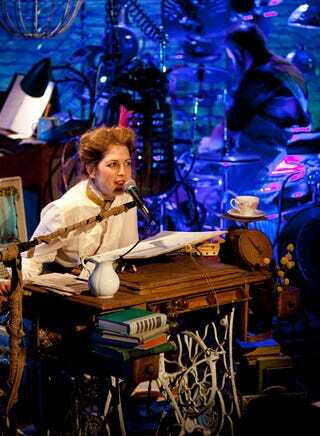 Tip: It's Steampunk: the Musical! Kinda like Harry Potter: The Musical only more indie and with lots and lots of goggles. The band that created this is from, surprise surprise, Brooklyn and I must say that it looks pretty rad. I want to go to there. Tip: Cool guys don't look at explosions. They blow... toy cars up? Tip: Someone has animated at least a good portion of Star Wars using ASCII. Yeah, it's true. Is it a huge waste of time or a colossal waste of time? But I guess I really can't judge because I'm sure some haters back during the Renaissance thought the painting of the Sistine Chapel was a huge waste of time and look who's laughing now! I'm assuming that would be Michelangelo. Or Pope Julius II. Tip: Having a hard time feeling motivated? Maybe a robot can help. A Hong Kong-based firm with the excellent name Intuitive Automata has developed a robot designed to help fatties combat obesity, by holding "conversations" with them about their weight. There is no word whether the invention is aimed soley at those without spouses. 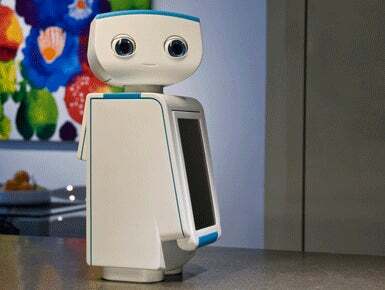 The faux-cute "robot", called Autom, sits on the desk and holds daily "talks" with users. The conversations are tailored to the individual after they have first entered information about their diet and exercise regimen. It's... cute? I'm sort of imagining it as being a fur-less Furby who has heart-to-hearts with you about how awful you look. Kind of like Short Circuit meets Stacey London. Tip: Meet your new Sci Fi overlords! This bit of news got lost in the excitement of ComiCon, but apparently there is a new network in the works that wants to be in direct competition with SyFy. It's name is... Syzygy. And, no, I don't know how to pronounce it either. Done a piece on the upcoming Syzygy Network yet? This network looks to give back Sci-Fi TV to (American) Sci-Fi fans, unlike "Siffy" and it's slow decline into wrestling and other crap. The network looks to keep costs low to begin with, to get its legs (and backers), which may mean old show repeats and/or indie works. But so far, the Facebook page seems to have quite the fan base! They even have non-Americans in favour of this! "Siffy"'s watered down programming must extend to the foreign counterparts. Also, the logo is a work in progress. They recently had a competition to make a better one than above, the choice is yet to be determined. The facebook page is here and I just have to say that they'll have my support if they bring MST3K back into syndication. Or if they just play re-runs. Or broadcast pictures of Mike Nelson and Joel with the song "I Will Remember You" playing softly in the background. Tip: Want to make your teatime feel a little more dangerous? Then look no further! Though by "dangerous" I might mean "adorable." via Neatorama and Dark Roasted Blend. I just want to draw hearts around them and make cooing noises. Bromancing it up, old school style. Tips: Jesus doesn&apos;t approve of man-on-bot sexiness, tour a cave in Klingon, and more! Nathan Fillion commands you to read, Boba Fett does dapper, plus zombie dice and toys! Black holes, fictional characters with real problems, BLARPs and more!